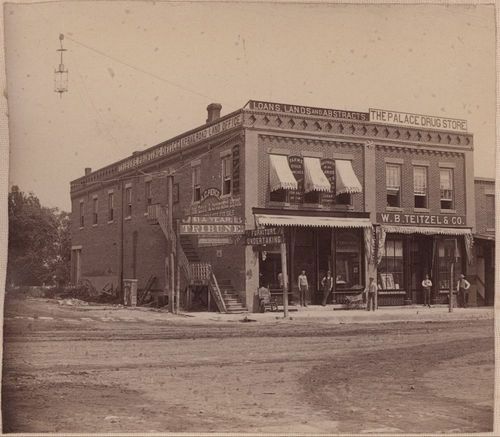 This photograph shows an exterior view of business buildings, including the Palace Drug Store, in Junction City, Kansas. A few men are visible standing in front of the buildings. Signs for other businesses pictured include the Tribune Printing Office; K. P. Railroad Land Office; A. C. Pierce Gent. Real Estate and Insurance Agent; Loans, Lands, and Abstracts; Furniture and Undertaking, and W. B. Teitzel and Company. Another sign above the entrance to the drug store reads, "Drugs, Chemicals, and Patent Medicines." This photograph is from the album "Views of Junction City" by Wheeler and Teitzel. Holding Institution: Charles F. Davis, pre-1897.